Are you planning for an Alaskan cruise? Our family had the opportunity to get an insider look at the brand new Norwegian Bliss cruise ship. I checked out everything aboard this new ship and now I’m going to share my Norwegian Bliss review and tips with you. From the restaurants to the rooms, and the deck plans to the kids’ clubs, here’s your guide to the Norwegian Bliss. What’s the Best Room on NCL Bliss? The Norwegian Bliss is part of their Breakaway Plus line of ships, the biggest ships in their fleet. The Bliss will be cruising to Alaska from Seattle during the summer months before making its way over to the Caribbean for the rest of the year. It can hold up to 4,200 guests. 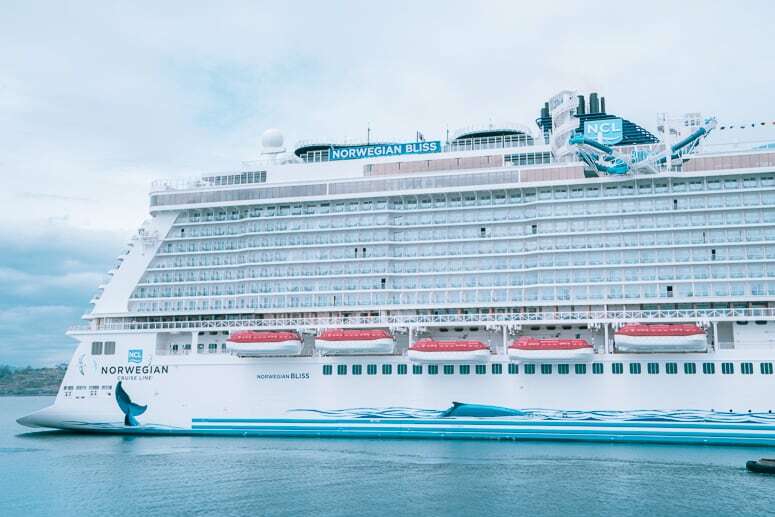 Your ultimate guide for the Norwegian Bliss cruise ship – New NCL ship doing Alaska cruises and Caribbean cruises. Check out the latest prices and deals for the NCL on Travelocity! The mini-suite balcony rooms have extra space in the bathroom. The room space itself is very similar to a regular balcony cabin. Other cabin categories are studios (for single travelers), inside, oceanview, balcony, spa, haven. That depends on where you want to spend the most time. In my opinion, it’s best to pick a room that is above and below other rooms, versus public spaces. I wouldn’t want a room above or below any of the restaurants or bars and would avoid being underneath the pool deck. I also aim to be only a couple of cabins away from an elevator/stairway to make it easier to move around the ship. However, situating yourself between two elevators can also give you options based on what part of the ship you need to reach. When choosing your cabin location, consider if you have any motion sickness issues. Midship cabins are more stable. The back of the ship can have a lot of movement. I’ve also heard that higher decks can have more motion than lower decks. Lastly, when choosing your cabin on the Norwegian Bliss I encourage you to consider your sailing route and the sunrise/sunset direction. If you’re doing a round trip cruise you should actually get both, but it’s always nice to consider the sailing direction and what you’re possibly passing. I can’t talk about the cabins on the Bliss without mentioning The Haven and telling you what it’s all about. The Haven is a private area on the top and front of the ship just for Haven cabin guests. It is an extreme luxury experience with a personal concierge and 24 hour butler. You’ll also receive priority boarding and priority reservations at the restaurants. The Haven has a private sundeck and the Horizon observation lounge in addition to a courtyard pool. Haven guests also have VIP reserved seats for all the theater shows. There is also a private dining option, The Haven Restaurant, available only for Haven guests. The Bliss is a foodie traveler’s dream ship. They have more restaurants on board than you can count with both hands. And, all come with unique cuisines and atmospheres. One of the things we personally love the most about NCL is their Freestyle Dining program. Enjoy a four-course meal and a great bottle of wine. Or grab a burger hot off the grill. Dress up. Dress down. Sit with your friends or make new ones. Dine inside or Oceanside along The Waterfront. Norwegian Cruise Line allows you flexibility with no fixed dining times or pre-assigned seating. This was a favorite of mine! If you’re a cocktail drinker, don’t miss stopping into Q and giving their smoked peach margarita a try! Smoked over hickory, oak and pecan wood, all our meats are infused with delicious flavors – whether ribs, chicken or brisket. Dig into some authentic Texas BBQ (extra napkins encouraged). As dinner winds down, the atmosphere heats up as a contemporary country band ropes you into a lively night of dancing, drinking and a honky tonk good time! The peach margarita at Q on the Norwegian Bliss is a must try! Warm up for your glacier walk with a Caramel Macchiato. Grab a Teavana® Shaken Iced Green Tea Lemonade to sip while lounging on a pristine Caribbean beach. Or recount the day’s excitement with your friends over Chai Lattes and a scone. Come on by Starbucks® to make your vacation even sweeter. Sample sizes of the over-the-top desserts at Coco’s. The regular menu has these fun treats in jumbo sizes! Slow churned, dense and intense in flavor, gelato is Italy’s answer to ice cream. And our version is the perfect accompaniment to a leisure stroll on your exploration of The Waterfront. A la carte pricing applies. An 20% gratuity, beverage and specialty service charge will be added to your check. Travel somewhere new with every delicious bite at Food Republic. Savor a fusion of foods and cultures from around the globe. Travel to Peru to scoop up some ceviche. Jet away to Japan and try a new kind of sushi roll, or have a hearty helping of noodles from China. Food Republic has an open and modern atmosphere. Modern dining at Food Republic with touchscreen menus on the Norwegian Bliss. Enjoy the flavors of the Tuscan countryside al fresco alongside the sea, or indoors at tables with room for old friends and new. Try a twist on a classic like lobster fettuccine, or keep it purist with a pasta carbonara. Italian dining at La Cucina on the Norwegian Bliss. Beautiful waterfront dining at Ocean Blue on the Norwegian Bliss. Pool deck dining at the specialty restaurant, Jimmy Buffett’s Margaritaville. You can order room service and the food is complimentary, however there is a $7.95 convenience charge and a 20% gratuity and specialty service charge will be added to all beverages and special occasion menu items. If you order a continental breakfast before 10 am you’ll avoid the $7.95 convenience fee. There are also about 16 bars aboard the Norwegian Bliss, so if you’re looking to really let go and sample all the great drinks, consider the unlimited open bar package add-on! You can book your cruise and dine exclusively at the main dining rooms, or even splurge and dine at an à la carte restaurant if you choose. However, many will choose the specialty dining package as one of their “Pick 5” promotion choices that Norwegian offers guests. With specialty dining you’re able to choose three of the specialty restaurants to dine at during your cruise at no additional cost (for most restaurants). Occasionally, a specialty restaurant, like Ocean Blue, will have an additional fee and/or menu exclusions. Our family loved this experience! It’s hard to believe you can race around a windy track 19 stories above the ocean! And the cars actually get some good speed. Add in the other drivers racing around you and those 8 laps become pretty intense. Great activity for the whole family, but do know there is a height minimum of 48″ and a maximum of 79″. The race track is on deck 19 and is an additional fee. You can pay for one single ride pass for $9.95 per person, an unlimited daily pass for $29.95 per person, and even an unlimited weekly pass for $99.95 per person. You do have to reserve your ride time, so be sure to book right away when you get on board. You’ll need closed toes shoes and hair needs to be pulled back. Race track at sea on the top deck of the Norwegian Bliss. Another fun activity our family enjoyed was laser tag. This was actually our first experience ever trying this sport, and wow, we’re not the greatest. However, it was still a lot of fun and the girls loved trying to get us, parents. There is an alternative to guns, called a Hero Blast if you want the experience without the shooting aspect. To make things more intense, consider a game at night! There is a fee of $5 per person for laser tag. Laser tag is fun to do with friends & family. The Aqua Park has two waterslides as well as two pools. Since we were on a May cruise out of Seattle, we didn’t get many opportunities to try the water park on board. However, Paul and Mia brave the slight chill one day and gave the slides a try for me. The Ocean Loops is probably the most eye-catching waterslide on board. It has clear sections and shoots out and over the side of the ship. This is a drop-down hi-speed waterslide, so weight matters. You need to be at least 99 lbs to ride, and hey, probably a good amount over that too. They actually have a trap door built into the slide in case someone isn’t heavy enough to make it up the loop and slides back down. It happens, I’m not supposed to know it happens but I kinda saw someone getting “extracted”. So, this isn’t a time to lie about your kids’ weight. There is another fun slide called the Aqua Racer which Mia was able to experience. It’s a closed tube slide that uses single or double tubes to swirl down and around in a dark and rope light tube. Paul says it is a slower slide, but Mia had a blast getting to ride with him. She loved the dark tube with sections of colored lights. I think there is a clock at the slide too, so you could challenge your friends to see who can race to the bottom the fastest! The Aqua Racer is part of the Kids Aqua Park. Whether your kids want to zoom down a tube slide or get drenched by tipping buckets or water cannons, younger kids will definitely have a blast. Aqua Park on the Norwegian Bliss. If I’m being honest the mini golf course feels like a bit of an afterthought on the Bliss. One of my biggest complaints about the Bliss is the loss of outdoor activity space like we enjoyed on the Norwegian Getaway. The race track is certainly awesome and fun to try, but my girls said they wished they had the ropes course still. The mini golf course of 5 holes seems to be the only space left for NCL to add some more outdoor play space. On deck 7 near the back edge of The Local restaurant is a two-lane “bowling alley”. Our family had a lot of fun playing against each other. I do recommend you have some patience or ask for help since it can be a little tricky setting up and occasionally the pin strings got tangled. If I recall correctly, the cost is $5 per game and you can swipe your room key to pay. Bowling at The Local on deck 7 on the Norwegian Bliss. There are two main theater shows in the Bliss Theater, and another adults show in the Social Club. Both of the Bliss Theater shows are excellent and our whole family enjoyed watching them. I will note that both the stage shows have some suggestive content that adults might not want their kids to see. They typically have two different showtimes, and early evening and later evening show. We saw the Jersey Boys on the Getaway but this was a completely different show. More than just a show featuring songs from the Jersey Boys, this is more of a musical story of their history. Journey from the gritty streets of Jersey to glamour and international fame as you follow the incredible true story of Frankie Valli and The Four Seasons. Jersey Boys on Norwegian Bliss. If you’re looking for a great dancing show, ¡Havana! is the show for you. Mambo back in time and feel the rousing pasíon of 1950s Cuba in its vibrant heyday. ¡HAVANA!, a lively musical that’s a celebration of music and culture, makes its world debut on Norwegian Bliss. Tony Award®–winning director and choreographer Warren Carlyle heads a team of Broadway creative powerhouses, including famed Cuban-American design duo Ruben and Isabel Toledo, creators of the spectacular set and vivid costumes. Another famous Cuban-American, Grammy-winning singer Albita, wrote the show-stopping songs. ¡HAVANA! is set at The Palace of Lights, where backstage intrigue combine with seductive rhythms and sultry dance moves to bring you an exhilarating, edge-of-your-seat and unforgettable show. This is Norwegian’s take on a speakeasy. This extra ticket event costs $29.99 USD per person and is not suitable for kids under 16. Your ticket does include five Prohibition Era specialty cocktails, each with a modern twist. Set in world-famous Madam Lulu’s New Orleans speakeasy, tantalizing madams will regale you with tales of bootleggers and some of the era’s most famous tunes that will have you dancing in the aisles. We did not attend this show, however, I think it’s like a burlesque show. I was told that tickets can only be purchased once on board at the Bliss Theater guest services desk. Pull up a chair in the legendary Liverpool club where the Beatles performed. Sip your Scotch Sour during an evening of good company and great music with a Beatles cover band. Jumpstart the evening with two talented stand-up comedians that will loosen you up with lots of laughs. And then let loose on the dance floor as a DJ spins your favorite tracks late into the night. While this might not make it on many lists for things to do on the Norwegian Bliss, I definitely recommend it for adults. It’s on deck 15 and offers little seating nooks as well as a huge wall of double story windows granting you 180º view while sailing. There is also a full-service bar inside. It’s the perfect spot to relax. The Observation Lounge was one of my favorite spots on the Norwegian Bliss. Find a seat, grab a drink, and settle in for some relaxation at the Observation Lounge on the NCL Bliss. Every night brings new thrills with exciting themed events on board. An urban street party featuring pop-Latin music will lure you to the pool deck where you can get your groove on at the hottest event at sea, Caliente. Then pull on your cowboy boots for another evening of dancing under the stars at Nashville Nights & Lights. From masquerades and silent disco to line dancing, get ready for a boot-scootin’ good time. Costumes encouraged! On deck 5, suitably right next to the teen kids club, is the video arcade. Both of my girls had a lot of fun playing games in the arcade and earning tickets they redeemed for some Chuck e Cheese-esque prizes. We decided to give the girls daily budget limits for the arcade and I’m happy to report that they both obeyed their limits. Arcade aboard the Norwegian Bliss. If you’re traveling with kids, there are three kids club areas depending on the ages. All are located on deck 5.
for parents and young kids for two hours. This is not a drop-off kids club, it’s only a space made available to parents of babies and toddlers. The main kids club on the Norwegian Bliss is the Splash Academy. Kids are divided into three age-group categories, 3-5, 6-9, and 10-12. Activities are planned and organized for the specific age groups. Kids who are in the 10-12 age group category can check themselves in and out of the club if the parent authorizes that on registration. Those kids will have to stay for 2 hours though if they are checked-in. My girls have always enjoyed meeting fellow cruisers their age in the ship kids clubs! There is a Late Night Fun Zone program for 3 – 12 year olds. It goes from 10:30 pm to 1:30 am and is run by the Youth Staff inside Splash Academy. It costs $24.00 USD per session for the 1st child, $20.00 USD per session for the 2nd child. Entourage Teen Club on the Norwegian Bliss. One of my biggest recommendations for your cruise is to book a treatment at the spa! More than just a spa with treatment rooms, you won’t want to leave this place. Be sure to allow time before and after your treatment to enjoy each of the unique spots the spa has to offer. There are lightly-heated tile loungers sitting in front of another epic wall of windows, giving you a cozy spot to relax and take in the view. Discover your peaceful bliss at the Mandara Spa on the Norwegian Bliss. The Thermal Suite is where I think the Mandara Spa on the Bliss shines. You’ll find a salt room, snow room, steam room, and sauna, in addition to the Vitality Pool. The Vitality Pool is a warm pool with button activated jets around the edges of the pool. There is also a button activated waterfall that can give you an amazing shoulder massage. Thermal Suite passes can be purchased on their own if you don’t want to splurge for a spa treatment. TIP: Check the prices of the spa level rooms, they include access to the Thermal Suite as part of room cost. Also, you can buy the Thermal Suite passes online in advance, which typically is cheaper than buying on board. Another tip is that occasionally the spa will offer deals on treatments during port times, so if you don’t plan to go ashore, book your spa treatment for then. The spa is typically less busy during those times, too. Looking from top to bottom, here is my guide to the Norwegian Bliss deck plans. This should help you when you’re deciding what deck to book your cabin on. Deck plans for the Norwegian Bliss – what to find where. These decks are where the outdoor activities are on the ship. On these decks you’ll find the race track, laser tag, and mini golf. The Vibe Beach Club is also there, it’s an adults-only sundeck lounge. It is good to note that all of these, except the mini golf, cost extra and can sell out. This deck is primarily for Haven guests. The waterslides are also accessed from this deck. Here you’ll find Jimmy Buffet’s Margaritaville at Sea and Le Bistro restaurants. You’ll also find the adults-only club, Spice H2O. Deck 17 also has some sundeck space as well as the jogging track. More of the Haven rooms and spaces, like their private observation lounge, are found on deck 17 as well. The Garden Cafe dining buffet and most of the outdoor space is found on deck 16. The Aqua Park, pools, and main sun deck space are all found on this deck. The Mandara Spa, beauty salon, and fitness center are on this deck as well. Aqua Park and Pool deck for the Norwegian Bliss. The Observation Lounge is on deck 15 and shouldn’t be missed. It was one of my favorite spots on the ship, and seems like a good spot to relax if you need a break from the crowds or sun. You’ll find the casino on deck 7 and I have to say a HUGE kudos to NCL because they made the casino on the Bliss, smoke-free! This is a big plus in my opinion. If you are a smoking gambler, there is a smoking room for you where you can still play some games. For families and non-smokers, this makes the entire center ship of decks 6 through 8 much more enjoyable than their other ships. Deck 7 also has the dining rooms for Local, the 24-hour eatery and The Manhattan Room, one of the main dining rooms. The upper level of the Bliss Theater is also located on Deck 7. Deck 6 is the other main dining deck, as well as the main entry for the Bliss Theater. You’ll also find the Guest Services desks here. This should be called the kids deck. Deck 5 is where you’ll find the three kids clubs as well as the Video Arcade. There are also staterooms on this deck. Get Deals on Port Activities and Shore Excursions with GetYourGuide! One of my best tips is to book your dining and show times in advance! You can typically book dining 130-90 days prior to sailing based on your stateroom category and length of cruise. You can book shows and spa services 90 days before your cruise. If you’re looking to do the race track, book your time as soon as you’re on board. You might also want to purchase your pass for the adults-only Vibe Beach Club if you’re wanting to experience that. Also purchase your pass for the adults-only Happy Hour Prohibition show when you get on board to secure your preferred time. There are touchscreens on each level of the stairs to offer you the opportunity to book dining and shows for that night directly from the screens. I’m unsure if you are able to book the race track or laser tag from these screens, but I “think” it might be possible. Touchscreens at the stairs of each deck can be used to book dining and shows. If you have a hard time remembering which direction is the bow/stern of the ship, look at the carpet! It took us until the last day of our cruise to discover that the fish are all facing the front of the ship! So when you’re in a hallway of cabins, just check the direction of the fish to figure out which way to head. If you are taking the Norwegian Bliss on an Alaskan Cruise or even a West Coast cruise, don’t forget that it evenings get chilly, even in the summer, and especially on the water. While walking around the Waterfront on deck 8 one evening I was actually wishing I had packed a small pair of lightweight gloves. Don’t forget that you need to check in online before your cruise. It as to be done at least a day before your cruise, but I would suggest you do it as soon as possible so it’s already done. You’ll need your government IDs (i.e. passports) for your online check-in. The check-in process will give you paperwork that you’ll print and bring with you to check in at the port. Cruises allow you to bring checked bags like an airplane but those suitcases are taken from you at the port and later delivered to your room; again like airplanes. For this reason, you need to pack well and know what you’re going to need access to when you get onboard the ship, this needs to go into a carry-on bag. Of course, any medications should be kept with you, but also consider if you’ll need any swimwear or technology. Our family likes to pack carry-on only and we actually take our suitcases onboard with us, which is allowed only for small carry-on luggage. This does present it’s own issues of having to haul your suitcases around the WHOLE check in process and getting to your cabin with packed embarkation elevators, meaning you probably need to haul it up some stairs. Packing light and carrying on means you have your luggage immediately and you don’t need to leave your luggage at the door the night before you leave the cruise either. People with checked luggage have to leave their luggage outside their cabin doors the night before disembarkation morning. Still looking to book? Here are some great cruise deals! I really hope this guide helps you when planning your cruise on the Norwegian Bliss. Let me know if you have any further questions! Things to Do and Know Norwegian Bliss Cruise Ship. Love your website! I am hooked. First cruise will be on the Bliss in 9 days!!! Thank you so much for all your hard work putting all this information together. I will be following you on YouTube! Yay! Thanks so much Shawna for the kind words. I hope you have a fabulous cruise!! Let me know if you have any questions. Hi Erika, I’m not sure about the layout of Deck 8 balcony cabins. I do know that’s where the waterfront promenade is so all the cabins on that level are forward. Perhaps the blocking is because the promenade hangs out and so if you’re looking towards the back of the ship your view could be obstructed. My advice would be to look on youtube or do a google search for “room tour 8XXX” and see if you can find any photos or videos showing the view. Hope that helps a bit! I was bountifully blissful aboard the Bliss this past August embarking on an exciting Alaskan itinerary out of Seattle. I cruise several times a year and am pleased to report that Norwegian Bliss was, and continues to be, my favorite of all of the ships I have sailed on. Favorite amenity? Go-kart track on the top deck! Admittedly, it was hard to keep my eyes on the track amidst all of the spectacular Alaskan scenery, but somehow I completed the session without incident!